I was inspired by the tomato pasta of my last post to cook something similarly fresh tasting. So this quick to prepare dish is the result, using ingredients that I already had in the store cupboard. I give you the recipe exactly as I did it, but of course if you don’t have Aliolli and/or Chilli Jam in your cupboard, change for fresh garlic and chilli to taste. A perfect lunch for one or a light colourful starter if you halve the amounts per person. Get a pan of water heating up for the pasta. Add to it 5 ml of the olive oil and half a teaspoon of salt. When the water is boiling, add the sundried tomatoes to the water and let simmer for a couple of minutes. Scoop out and leave to cool. Add the linguini to the water and leave to cook at a medium simmer. Put the other 5ml of olive oil in a shallow pan. Add the aliolli and chilli jam. Slice the sundried tomatoes and add to the pan. Remove stones from the olives and cut each olive in half. Add to the pan. Halve the tomato across its equator and using a fine grater grate the pulp into a bowl until you are left with just the skin in your hand. If the grater is fine enough it should sift out the majority of the seeds. If the odd seed makes it into the sauce, it is not the end of the world. Add the fresh tomato pulp to the shallow pan. When the pasta is two or three minutes from the al dente stage of crookedness, slowly heat the sauce stirring to mix all the ingredients. Once the pasta is cooked, drain and add to the sauce. Mix well to coat the pasta with the sauce. Season with salt, freshly ground black pepper and two thirds of the basil leaves. Turn again to mix in. 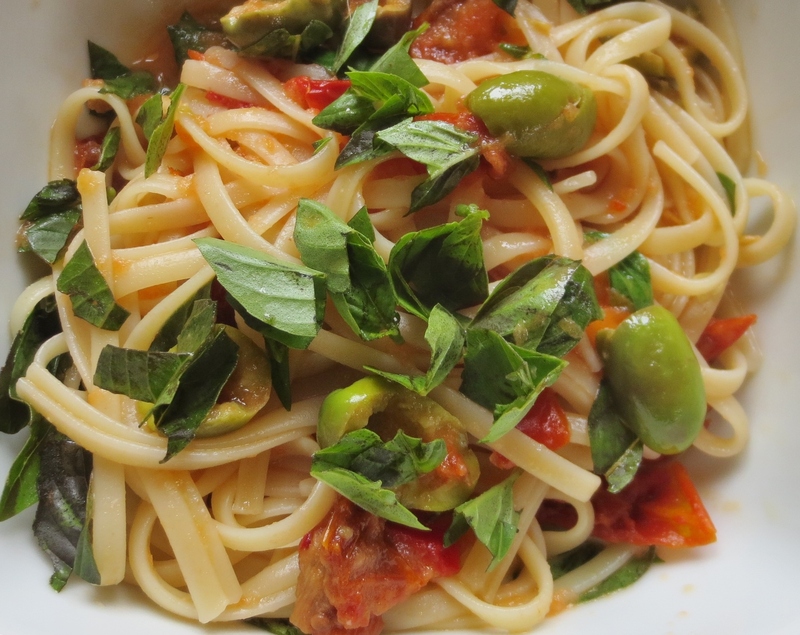 Turn into a pasta bowl and garnish with the rest of the basil leaves.